This is a simple case which answers the common question : Is my child too young to detox? The answer is a big fat no! Just do it! Here I interview Andrea who detoxed her son with fantastic results. Rita: So Andrea, what was your first impression of homeopathy? Andrea: My first thoughts years ago were that I did not understand it. No one that i knew used it or talked about it. My paediatrician gave me the remedy for croup to use last year and I was happy to use anything natural. Rita: So how did you come about detoxing? Andrea: I started reseaching vaccine injuries and came across your page. You have taught me everything. We had our first appointment and I trusted you. Rita: We started treating Waylon at 13 months old. You said you were concerned because he didn’t point or shake his head. His verbal skills were of a concern. His stools were not great and you knew something wasn’t quite right. Andrea: He stopped talking around his 6 months DTaP vaccines. He threw up, had a stuffy nose, a dry cough, and never made verbal sounds again. Rita: So I started with a constitutional remedy which i don’t always do.. and I remember you had improvements immediately. Andrea: Within 24 hours he had fully digested stool, began using his voice ( a lot!). At 13 months he only had two teeth, and within 7 days the top two ones started to break through. He has an overall mood increase. I can only describe it as a fog lifted from his brain. Rita: So we boosted his immune and started everything working well before the vaccine detox. He made a great start. Andrea: When we started the vaccine detox the only time he stopped babbling was when when he was sleeping! When we had finished he had begun standing and walking without assistance and had four teeth about to break through. Rita: Then sometime passed and you let healing just take its natural course. Then we did something I haven’t done before or since – you both did an ultrasound detox – together. Andrea: I estimated about 10 ultrasounds, 3 of thse were structural and lasted about 30 minutes each, I assume I have 1 hour 45 minutes worth of sound waves in our bodies. Rita: Wow, when you put it like that that really makes you think. Andrea: There were so many breakthroughs its hard to keep the list concise. He began dancing to music and giving kisses, said dada and hello, walking on tiptoes, babbling, spinning in circles, new levels of awareness, new curiosity of how things work, back to sleeping 12 hours a night, said hi and bye, squealing with excitement, said mama, stacking boxes, waving bye-bye, laughing hysterically, did hand motions with me during a song, started running, and pointed to his nose when I asked him to. When we started he was very overwhelmed around groups, now he is completely fine! My own improvements were weight-loss and fewer headaches. Rita: Who would have thought ultrasound detox would have such an amazing impact on your son and weight-loss for you! Incredible. We still don’t know the full extent of ultrasounds. I do know that many other parents see huge gains from doing them. I am so super happy about the complete turnaround for Waylon. 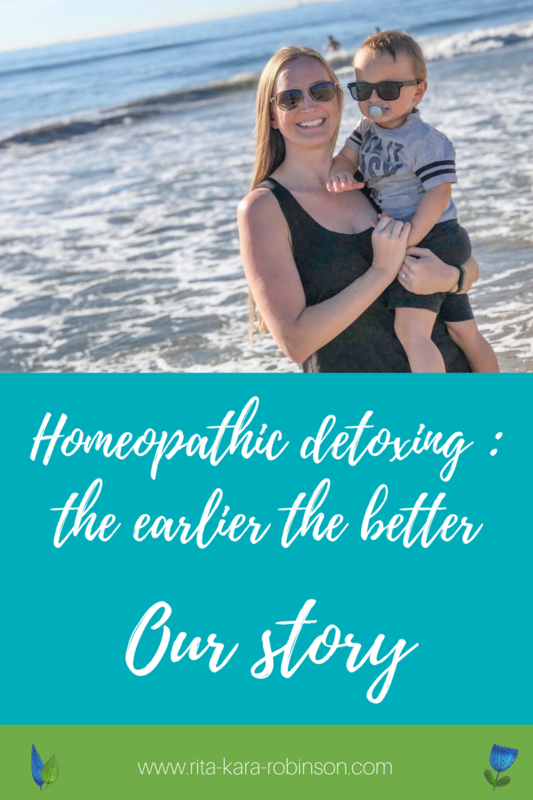 I hope that this post will inspire other mum’s to try a detox. What’s next for you? Andrea: Well you told me to buy a kit and a book. That’s when I really started learning about the power of homeopathy. Mary Aspinwall has a learning group and I just kept reading. I became a sponge when invested! The bottom line is as an American, all they push is prescriptions and Tylenol over here. Rita: I am glad you finally found an alternative to those things and came over to my homeopathy academy where we teach you how to use a kit for simple acute problems. Now you have everything you need. Andrea: Waylon is perfect now. Rita : It has been more than a joy working with you both. I am so happy for you two. Thank you so much for sharing your story to give other mothers hope of recovery.